This Memorial Day Weekend at Tampa's Lowry Park Zoo! 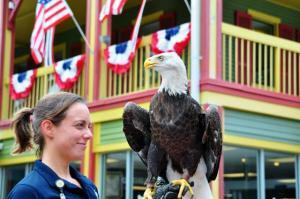 This Memorial Day Weekend at Tampa&apos;s Lowry Park Zoo! Hey there folks! Jerm here with an update on what&apos;s going on this weekend at America&apos;s favorite Zoo for Memorial Day Weekend! Fresh off of $5 day last Sunday at Tampa&apos;s Lowry Park Zoo, the animals want you invite you back for Summer Safari Night, and a special tribute to members of the military. *NEW NIGHT* Saturday, May 26 • 5-8 p.m. The Zoo stays open late with free unlimited rides, special animal encounters, and great food and drink. Live music by “Mainstream Band.” Extended hours are included with Zoo admission. Monday, May 28 • 9:30 a.m.-5 p.m. In honor of Memorial Day, military personnel (active-duty and retirees) are entitled to free admission on that day. The military member will need to show a Department of Defense photo ID at the Zoo’s ticket counter. As many as three direct dependents of military personnel also are entitled to free admission. Dependents may take advantage of the offer without their service member, though an adult must accompany minors. Great way to get out and enjoy the weekend with families so be sure to head out and enjoy it! Click here for more information on ticketing and check back for more updates on things to do in Tampa Bay!